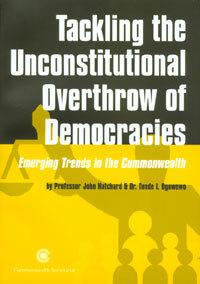 There is a rich history of case law within the Commonwealth where there have been legal challenges to the unconstitutional overthrow of governments. These cases and a commentary on them are set out in this publication. It critically examines the evolution of judicial decisions on the subject. In doing so, it also evaluates jurisprudential theories underpinning these judgements. The position of the Commonwealth is set out, especially its strong stance against the unconstitutional overthrow of governments. Consideration is given to possible constitutional provision which would reinforce democracy and offer protection to citizens against the unconstitutional overthrow of governments.